This chUrNai is considered to be the explanation for dhvayam. While SrIman nArAyaNa is supposed to grant all boons (sakala phalapradhO hi vishNu – vishNu dharmam), why surrender first to pirAtti (SrI mahAlakshmi)? Just as a son who has left home for several years, when he returns, he goes first to his mother and seeks her acceptance before meeting his father, SrI rAmAnuja feels that he should first get pirAtti to hear him out. Moreover, isn’t she “suhrudham sarvabhUthAnAm” (bhagavath gIthA – one who thinks well for all beings)? In both her eyes, she has “chandran” (i.e. she has only affection) while emperumAn has anger in one eye (“sUryan”) and affection (“chandran”) in the other. When SrI rAmAnuja approaches nArAyaNa, what if nArAyaNa looks at him with anger, considering his past deeds? He thus feels it is safer to surrender to her first. With her blessings, he even gets the courage to ask SrIman nArAyaNa to forgive him, later on. bhagavan nArAyana – The term bhagavAn refers to all the desired qualities to be possessed, without any defect. Of the innumerable qualities, 6 important qualities are highlighted – gyAna, bala aiSvarya vIrya Sakthi thEjas (knowledge, strength, control, energy or vigour, power and radiance respectively). SrIman nArAyaNan performs three major roles – destroyer, creator and protector. For each of these three roles, two qualities are most important. For his role as destroyer, he needs to have gyAna and bala. gyAna (knowledge) is required to ensure that when AthmAs leave their physical bodies in which they were residing during their stay on earth, they carry with them all the karma and sUkshma bhUthams (the five sensory perceptions), and to ensure that there is no mix-up between the deeds and the AthmAs. bala (strength) is needed to take in the entire universe during praLayam (total destruction, at the end of brahmA’s day time). For his role of creator, he needs aiSvarya (control) and vIrya (energy) -aiSvarya here does not only denote wealth, but mainly the ability to appoint, direct and lead the AthmA in its journey. vIrya is the ability of emperumAn not to get enervated after creating the universe. He does not even sweat after such a humongous task. That is vIrya. For his role as protector, he needs Sakthi and thEjas – Sakthi (power) to protect the devotees from their enemies and thEjas (radiance) to ensure that enemies can not come anywhere near him to harm him when protecting his devotees. nArAyaNa – refers to his role to provide residing place for all sentient and insentient beings. While the term bhagavAn may be used to refer to some others also as a matter of respect (for example vyAsa bhagavAn, nArada bhagavAn et al), the term nArAyaNan refers only to him, both as a conventional usage of the term and as the meaning of the term from the composition of words. nArA: refers to the collection of groups of all living beings (many species of animals, many species of plants, many species of human beings, etc) and ayana means resting place. When the two words combine, as per pANiNi’s grammar, the combination is spelt as nArAyaNan which refers to SrIman nArAyaNan only. Thus the words bhagavan nArAyaNan refer to the Lord with all the great qualities and the possessor of the two vibhUthis (nithya vibhUthi, or SrIvaikuNtam [spiritual realm] and leelA vibhUthi or samsAram [material realm]). 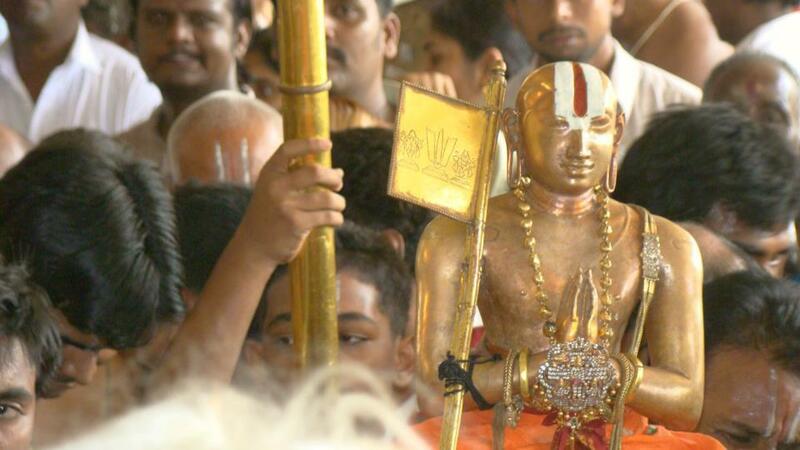 One may ask, why should SrI rAmAnuja talk about nArAyaNan when he is about to surrender to pirAtti? Just as a source of water is required for cultivating land and a bund (embankment) is required for a lake, it is necessary to give the basis for pirAtti’s many great qualities and her great wealth. Just as we say SrIman while referring to nArAyaNan, we also say vishNu pathni (wife of vishNu) while referring to SrI mahAlakshmi. To understand the greatness of pirAtti, we need to know the greatness of perumAL. abhimatha anurUpa – pirAtti is liked by him always and her beauty is appropriate to his. In our normal lives, we would see couples who are both good looking or who are both having good qualities. Only in the case of dhivya dhampathi can we see both the qualities in both of them, i.e. 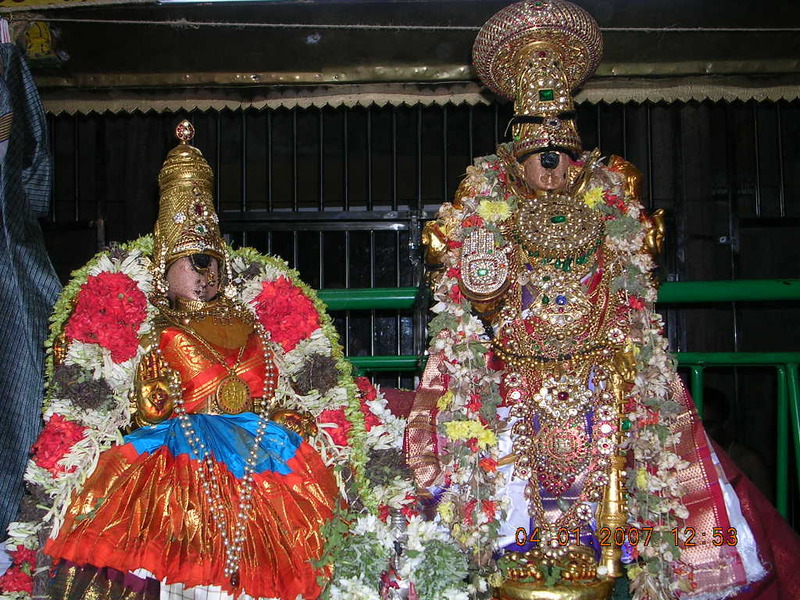 abhimatham and anurUpam. What is liked by either of them in the other and what is appropriate in each to the other are explained by the subsequent terms. svarUpa rUpa guNa vibhava aiSvarya SeelAdhi – that is, her svarUpam is liked by him and his svarUpam is liked by her. Similar is the case with every quality or characteristic. When rAvaNa showed the severed head of SrI rAma to sIthA and indhrajith similarly showed the severed head of sIthA to SrI rAma, they were stunned initially but knew that it was false. This was because of the svarUpam that was liked by each in the other. In the case of rUpam too, each is appropriate to the other. Their physical beauty complements each other. guNa here refers to the characteristics of the physical form – qualities such as saundharyam (beautiful in specific aspects of the thirumEni (body)), lAvaNyam (beautiful in overall aspects of the thirumEni/form) etc. pirAtti uses these qualities to make SrIman nArAyaNan to look at us with kindness and to forgive our transgressions, and thus these qualities are dear to him. vibhava means wealth. If she is the word, he is the meaning. The two are inseparable. All that is masculine has his stamp and all that is feminine has hers. Her possessions are very dear to him and are not like the wealth that he possesses (garland, sandal paste, parrot etc). aiSvarya – ability to direct or lead or control others. She controls the three types of chEthanas (sentients) such as badhdhAthma (still bonded to samsAram, like us), mukthAthmA (those who have got liberated from here and reached SrIvaikuNtam) and nithyAthmA (those who are always in SrIvaikuNtam and never take birth here like us) through their karma (in the case of badhdhAthmA), svarUpAnurUpam (being sEshabhUthan and pArathanthriyan, in the case of mukthAthmA and nithyAthma) and she also controls SrIman nArAyaNan through her love and affection by reminding him about his role as a protector and that he has to grant mOksham to the bhadhdhAthmA when he surrenders. perumAL feels happy when she undertakes this role as it is said that for an uththama purusha (highest level of AthmA) he is expected to listen to his pathni (consort). What has been said about aiSvarya is applicable to other qualities such as gyAna bala vIrya, Sakthi and thEjas. Seela – a quality that does not look at the shortcomings or defects in followers; person at a higher level moving with people of lower ranks, treating them as equals; she is equal to him in her practices and rituals. perumAL in his avathAram as SrI rAma, made common cause with persons such as guha (boatman), sugrIva (a monkey king) and vibhIshaNa (a rAkshasa). Similarly pirAtti as sIthA was very friendly towards the rAkshasis who were troubling her no end to make her yield to rAvaNa’s wishes. She also spoke to rAvaNa asking him to make friendship with SrI rAmA if he wants to be alive. She did not hesitate to advise him even though he was much inferior to her. This quality is very much liked by perumAL as this is a role that he too plays often (of being a protector). Adhi – this means starting from the above-mentioned qualities, there are many more such qualities that pirAtti has. It may be possible to speak about perumAL’s qualities, but it is impossible to speak about her qualities, says the vyAkyAthA, periyavAchchAn piLLai. anavadhikAthiSaya – each of the above mentioned qualities is unlimited in terms of expanse and is also wondrous. kalyANa guna ganAm – these qualities are also auspicious in nature. These qualities, found in perumAL also, complement each other. One may even find a fault in perumAL‘s qualities – that he is totally independent (swAthanthriyam) but none can find any fault in pirAtti’s qualities. His svAthanthriyam would make him angry when he sees us committing mistakes but she converts the mistakes also into good deeds. And, the qualities are in abundant quantities. padhmavanAlayAm – this refers to auspicious qualities. She gives sweet fragrance to perumAL himself, who is referred to as “sarva gandha:” (epitome of all fragrances). This also refers to her being sweet to perumAL and as being a source of enjoyment. bhagavathIm – she too possesses the 6 qualities mentioned for bhagavan earlier in this explanatory note. She is someone who even bhagavAn would be glad to perform pUjA (worship). Taken together, the two terms padhmavanAlayAm bhagavathIm would mean that if devotees approach bhagavAn through her, she would ensure that bhagavAn would not mind the shortcomings in the devotees and would grant them their desires (mainly mOksham) through her sweetness. Sriyam – while everything else in the world takes shelter under her, she takes shelter under him. She controls everything and she is controlled by him. However the two are inseparable, just like a gem and its powerful rays or flower and its fragrance. Sriyam is derived from SrI: which means that she is the leader of everything else and in turn is led by him; she hears our plights and in turn makes him listen; she cuts off all our past misdemeanours and enables us to reach him. dhEvIm – full of radiance. nithyAnapAyinIm – always dwells with him, and is inseparable from him just as it says in vishNu purANam “vishNor SrIranapAyinIm”. niravadhyAm – without any defect; in other words, if all the qualities mentioned so far have been with her for her own sake, that would be considered as a defect or shortcoming. But if these qualities are there for bringing succour to her followers, then they are said to be defect-free. dhEvadhEva dhivya mahishIm – being the queen for the Lord of all the dhEvathAs; i.e. being pirAtti (consort) to perumAL. akhilajaganmAtharam – being the mother to all the beings (all the three types of AthmAs). She lives for the well-being of everyone. asman mAtharam – SrI rAmAnuja considers himself as one of the beings, but a little bit special and hence makes a separate mention of pirAtti being his mother too. aSaraNya SaraNyAm – being the last resort for those who have nowhere else to go. She overlooks all our shortcomings if we display a little bit of good quality. On occasions, even if we do not have an iota of good quality, she still overlooks all our shortcomings. emperumAn is normally the last resort for those who have nowhere else to go. In the case of persons for whom even perumAn is not approachable, she functions as the last resort. ananyaSaraNa: aham – Is there anyone for whom there is nowhere else to go? asks pirAtti. SrI rAmAnuja says that “aham” (I am) is that person. SaraNam prapadhyE – such a person who has nowhere else to go and who has approached you, now surrenders to your lotus feet as a means, claims SrI rAmAnuja in this last phrase of the first chUrNai. We shall now proceed to the second chUrNai. This entry was posted in gadhya thrayam, Other, SaraNAgathi gadhyam on November 28, 2015 by T N Krishnan.